February 17, 2014 September 8, 2015 / Javan H.
Ay, you know what’s better than doing Baton Rouge? Doing Baton Rouge on someone else’s dime! That’s how I struck big this weekend, getting information for two new blogs. I took a long-awaited visit Leo’s Rollerland this past Saturday for a birthday party, but since I still need to edit the accompanying video, I’ll jump to Sunday’s festivities. My family went out to eat at TJ Ribs on Acadian Thruway, and I will use this entry to tell you about our experience. I never understood the backwards “i” in the street-side logo. A local institution, TJ Ribs first opened its doors roughly twenty-five years ago, named at its founder, TJ Moran. The restaurant is a hot-spot for college athletics enthusiasts, home to artifacts such as Shaquille O’Neal’s massive sneakers, a winning basketball hoop and memorabilia of LSU great Pete Maravich. 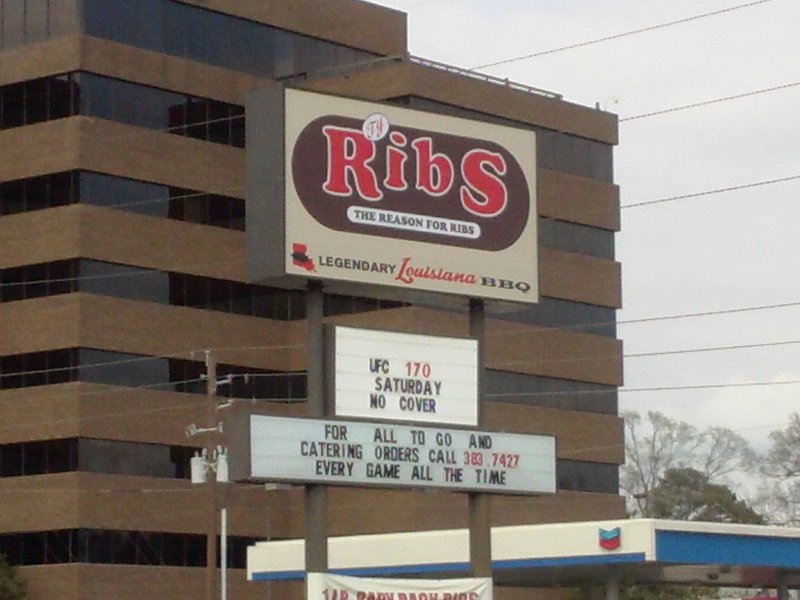 TJ Ribs’ locations also host sports viewings, including the upcoming UFC-170 mixed-martial arts fight. 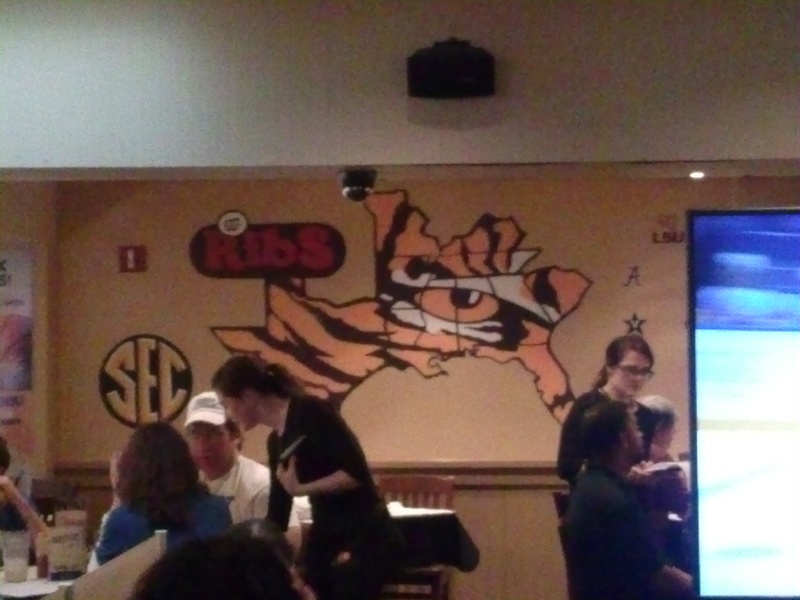 Damn, I miss having Fuel TV… Inside, the facility is decked out with plaques and athletic awards from both LSU and Southern, and in the late 2000s, the company expanded to a second location, occupying the former Smokey Bones on Siegen Lane. This wasn’t my first visit to TJ Ribs. I went there sometime between 2004 and 2005, before I moved to Baton Rouge from Katrina. As a teen, I fell in love with those succulent ribs that slid off the bone, but to my surprise, it took ten years for me to find my way back. My grandfather gave our family the choice of Red Lobster or TJ Ribs. I’ve frequented Red Lobster back home, but I’ve yet to eat at this new one. I still hope to in the immediate future, but we all ended up choosing TJ Ribs, giving me the chance to breathe more air into this blog series. When we got there, I knew I needed to snap a photo of the “Tiger Wall.” I’m unsure of the official name for the mural, but I’ve seen it on Metro 21’s The John Delgado Show, hosted by the metro councilman who serves that area. For a busy Sunday, the wait time was satisfactory—twenty minutes. Our party of six was seated near a large TV showing the Olympics, as other TVs in the upbeat, low-lit restaurant were also tuned to sports channels. I was within clear shot of the tiger mural, so I hurried up and snapped a photo. The mural highlights the states that make up the Southeastern Conference of college football. Mike the Tiger’s eye is commonly found on LSU merchandise. 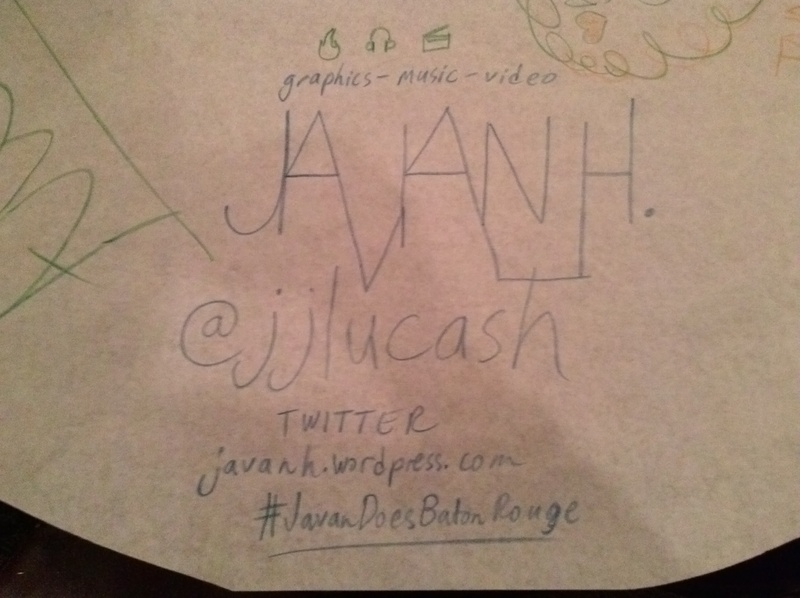 I had also forgotten about the table cloth and crayons; at TJ Ribs, the tables are covered with a large sheet of paper, and the guests are given crayons to write with. A graphic designer on the up, I made sure to use a chunk of the space to plug myself. Our server’s name was Alesha, and she was, without a doubt, high in spirits that day. My grandmother ordered first, a barbecue ribs/smoked brisket au jus combo that came with two sides (#4 on the menu under ‘Combinations’). 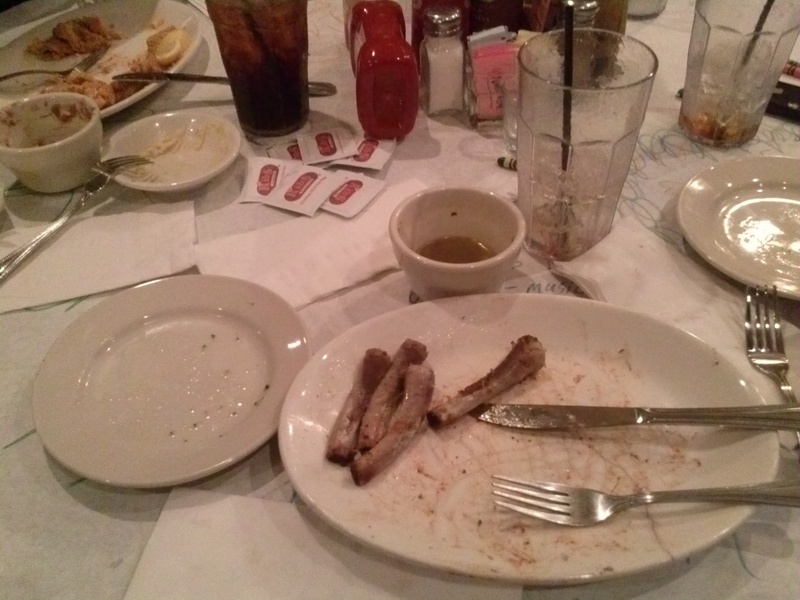 I did want my ribs, as the ten year-old taste never left my mouth. 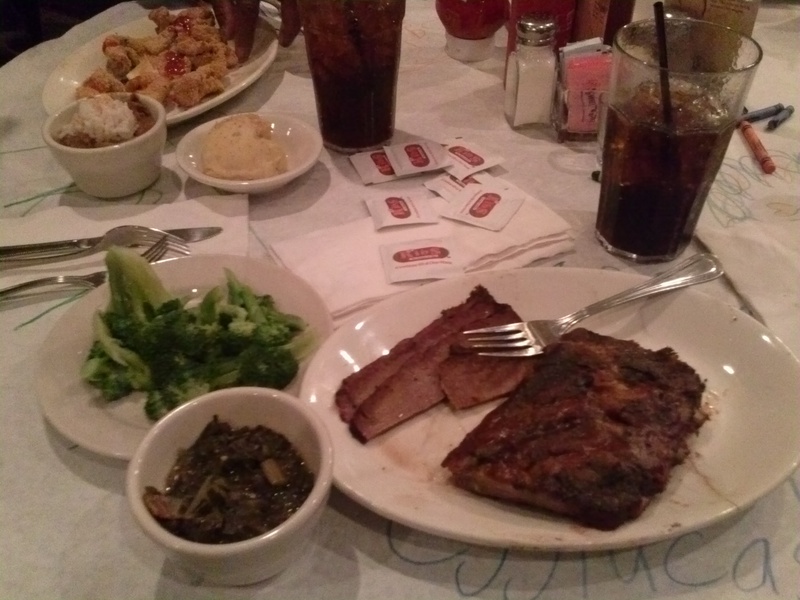 But at the same time, I hadn’t had brisket since 2002; I ordered the ribs and brisket combo as well, with a Dr. Pepper. For the sides, Alesha was promoting the collard greens pretty hard, but my grandmother didn’t want that. With my mind already made up, I ordered them myself, along with steamed broccoli. After our orders were taken, I pointed out to my eldest goddaughter that the servers learned to write their names upside down, made evident by Alesha’s cursive on the paper. To be honest, we probably waited longer to be seated than we did for our food. My ribs, brisket and veggies came to me hot and fresh, but there was a bit of a mix-up with some of the other orders. Silverware may have been on short supply as well, but they were brought out immediately. I had completely forgotten about that until I started typing this blog. It took a short amount of time to flag down a member of the staff, but they did fix everyone else’s orders with haste. My grandfather enjoyed his catfish and potato salad, and both he and my eldest goddaughter loved the red beans. I used the word ‘haste’ because it rhymes with ‘taste.’ With that said, the four ribs actually tasted better than I remembered, and the four slices of the brisket were on point as well. I’ll point out that TJ Ribs spends a whole day marinating their ribs in their special seasoning before slow-cooking them. Before I dove into the main dish, though, I had to taste the collard greens. Served in a small cup, they were as juicy and flavorful as a guy like me could ask for. They also had a spice to them, which earned the restaurant even more brownie points. I devoured my food in minutes, snapping an ‘after’ photo of the ravaged area. 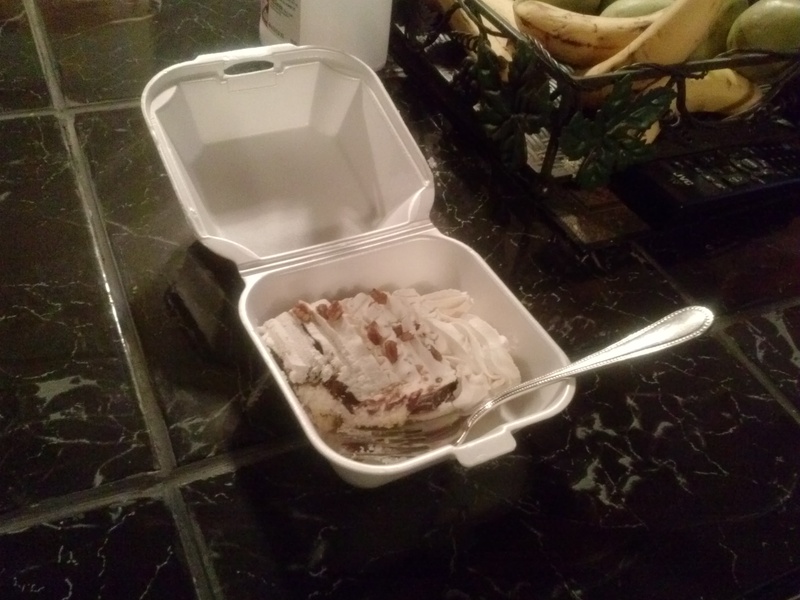 No, I didn’t use a to-go plate. I was delighted to finally make it over to TJ Ribs after the years-long wait, and I’ll say that the return visit was well worth-it. I now have even more incentive to spend my own $15 on another #4 Combo. My meal filled me the hell up, but my appetite has been somewhere in the clouds over the past few weeks. 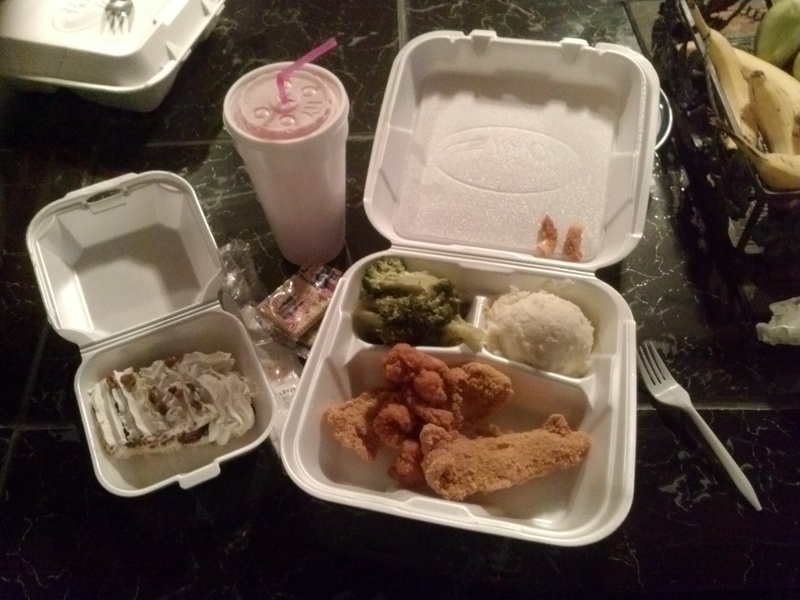 On the way home, still reeling from TJ Ribs, I grabbed some Piccadilly’s, ordering my usual catfish dinner and mud pie. Full from two large meals, you can bet a dollar on LSU, Southern and BRCC that Javan H. slept like a baby. I will have my recap of Leo’s posted within the next few days, and stay tuned for more as I continue to roam around Baton Rouge. My Space Shuttle will be launched for the eleventh time on Mardi Gras Day, March 4, 2014. In addition, check out my first foray into the Baton Rouge media market — I designed the new virtual set for ‘MyScene TV,’ a local lifestyle show airing Thursdays at 11:30pm on WBHX 16. Please read my other blogs, follow me on Twitter and check out my work on here, YouTube and SoundCloud.